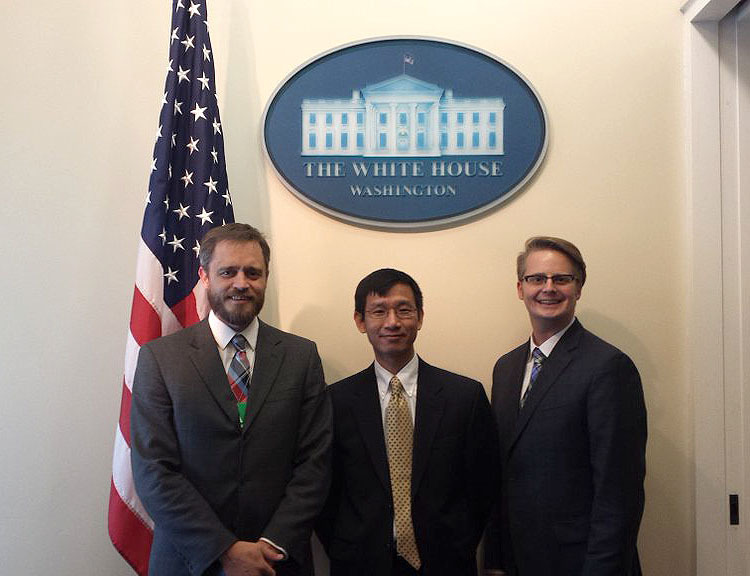 On Wednesday, January 20th, three faculty members in the Department of Educational Leadership and Policy Studies attended the Education Scholars Convening on Community College Research at the White House: Dr. Shouping Hu, professor of higher education; Dr. Toby Park, assistant professor of economics of education and education policy; and Dr. David Tandberg, associate professor of higher education. The meeting, which discussed research on strengthening community colleges and expanding college opportunities for students, included remarks from senior officials from the White House Domestic Policy Council, White House Council of Economic Advisers, and the U.S. Department of Education. “There are strong desires to utilize research evidence to inform policy making at the federal level, in the direction of removing financial barriers for student access and success in postsecondary education, particularly in community colleges.” Hu said. Drs. Hu, Park, and Tandberg are well known for their research with community colleges. In addition to serving as faculty in the FSU College of Education, Hu is founder and director of the Center for Postsecondary Success (CPS) at Florida State University, with Park and Tandberg serving as associate directors. For more information on specific projects and research being conducted by CPS, visit centerforpostsecondarysuccess.org/projects.